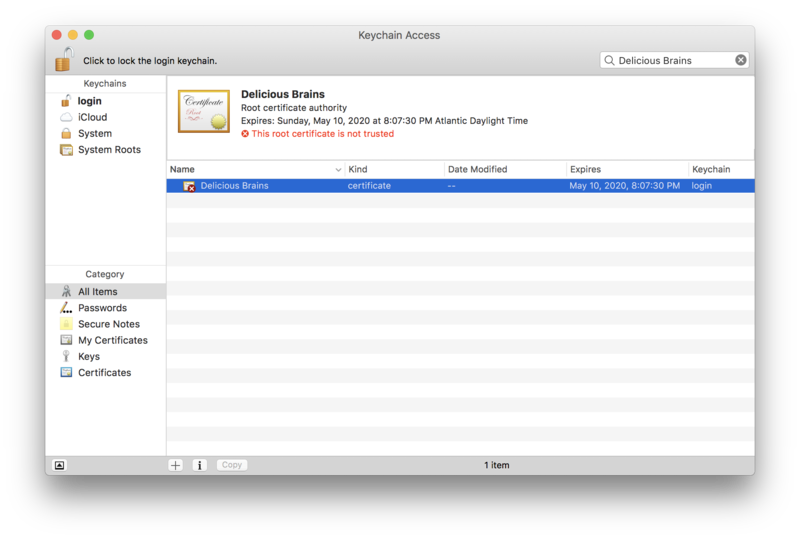 In my last article I described how to generate your own self-signed SSL certificates and add them to macOS Keychain so that your browser doesn’t give you a privacy error. If you have a few servers you need to do this with, you can just create yourself a CA (Certifying Authority) certificate and load that instead. Then your self-signed certs, signed by your CA cert, will all be accepted without you needing to load each one. So basically he’s saying that I can be a certificate authority (CA) like Let’s Encrypt, Amazon, Verisign, Comodo, etc but just for my local network. How did I not know about that? So cool. But how does it work exactly? After some research I think I get it now. To request a certificate from a CA like Verisign, you send them a Certificate Signing Request (CSR), and they give you a certificate in return that they signed using their root certificate and private key. All browsers have a copy (or access a copy from the operating system) of Verisign’s root certificate, so the browser can verify that your certificate was signed by a trusted CA. 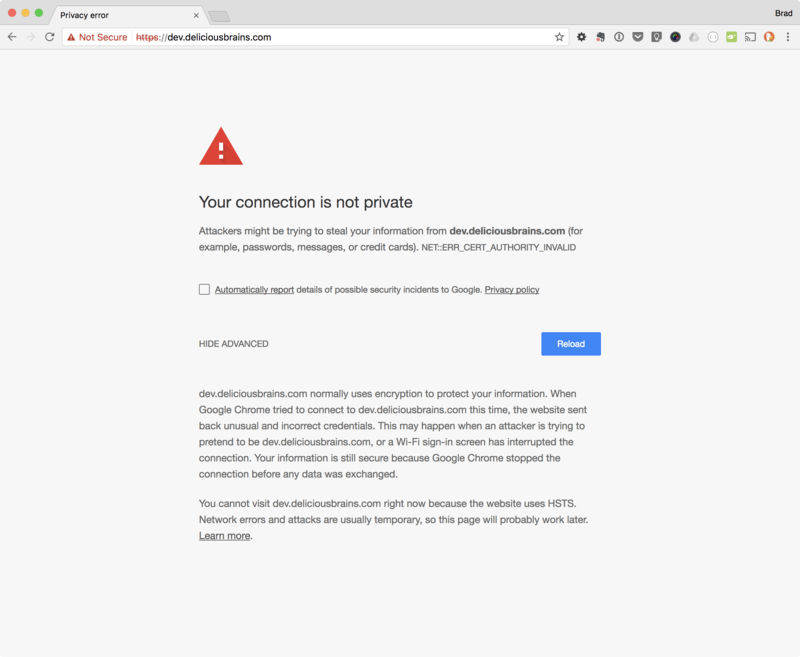 That’s why when you generate a self-signed certificate the browser doesn’t trust it. It’s self-signed. It hasn’t been signed by a CA. But as Ross pointed out, we can generate our own root certificate and private key, add the root certificate to all the devices we own just once, and then all certificates that we generate and sign will be inherently trusted. You will prompted for the pass phrase of your private key (that you just choose) and a bunch of questions. The answers to those questions aren’t that important. They show up when looking at the certificate, which you will almost never do. I suggest making the Common Name something that you’ll recognize as your root certificate in a list of other certificates. That’s really the only thing that matters. You should now have two files: myCA.key (your private key) and myCA.pem (your root certificate).  Congratulations, you’re now a CA. Sort of. To become a real CA, you need to get your root certificate on all the devices in the world. Let’s start with the ones you own. 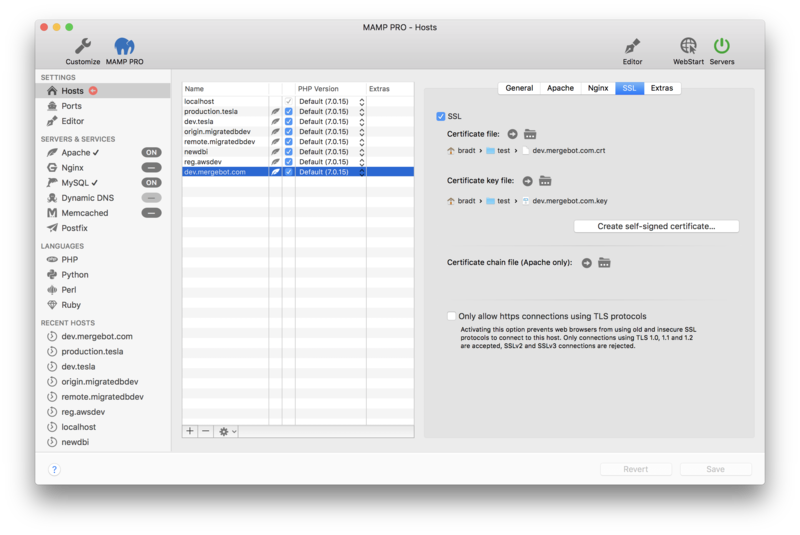 We need to add the root certificate to any laptops, desktops, tablets, and phones that will be accessing your HTTPS sites. This can be a bit of a pain, but the good news is that we only have to do it once. Once our root certificate is on each device, it will be good until it expires. You’ll get all the same questions as you did above and, again, your answers don’t matter. In fact, they matter even less because you won’t be looking at this certificate in a list next to others. Next we’ll create the certificate using our CSR, the CA private key, the CA certificate, and a config file, but first we need to create that config file. We’re using a different config file for the SAN than in my last article because we’ll be running the openssl x509 command instead of the openssl req command. From what I understand, the x509 command is needed to do the signing with the root certificate and private key. Again, I found this example config file on Stack Overflow and it seems to work. You should be prompted for your CA private key pass phrase. I now have three files: dev.mergebot.com.key (the private key), dev.mergebot.com.csr (the certificate signing request), and dev.mergebot.com.crt (the signed certificate). For any other dev sites, we can just repeat this last part of creating a certificate. No need to install any new certificates on any of my devices. Much better. 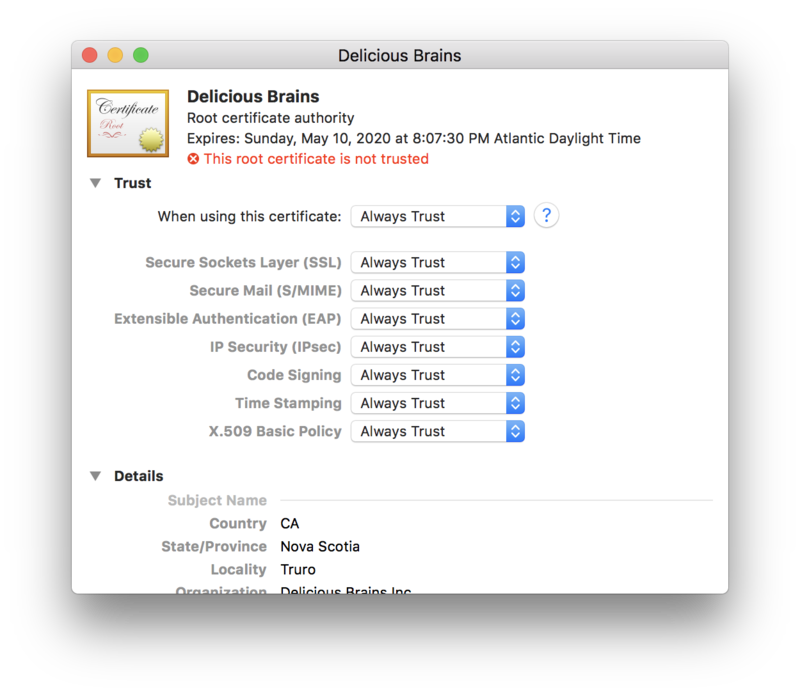 After going through the process of setting up my own CA and signing certificates with it, there’s no question this is a better way to go than creating individual self-signed certificates as described in my last article. The fact that you only have to setup the CA and add it to your devices once means you save a bunch of time for each new certificate you create in the future. It’s a no-brainer to go this route. Have you tried setting up a CA of your own? Maybe you’ve been using your own CA for years? Are there any drawbacks that I missed? Let me know in the comments below. This entry was tagged SSL, HTTPS, Development Tips, Development Environment, MAMP, Certificate Authority, OpenSSL.